Henry Holt and Co. (BYR), 9780805087178, 80pp. An irresistible collection of short stories for cat lovers. At the annual gathering of the MEOW society, cats of all kinds convene to share their stories and those of their ancestors. Chico, the smallest cat in the world, recounts stopping a crime. The Pirate Cat tells of the fateful day when he discovered a treasure while hunting for mice. And Georgio shares his delectable—and sometimes surprising—recipes. 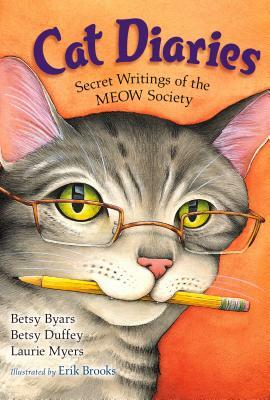 Cat Diaries is a winning companion to Dog Diaries, also by Betsy Byars and her daughters Betsy Duffy and Laurie Myers. With gorgeous black-and-white illustrations by Erik Brooks, animal lovers and reluctant readers will be wooed by the charm, strength, and wit of these feline friends.